"This was my first international clothing purchase and I couldn’t be happier with Sarosh Salman. From their customer service to the quality of their clothing, everything was fantastic. I ordered my shalwar Kameez without any issues and it came in exactly when it was supposed to without any delays. The clothes are stitched beautifully and are sizing is perfect. I would certainly use them in the future and highly recommend them. " "This is my second time purchasing a dress , and once again I’m amazed of how beautiful it is in person, perfect measurements and best of all is the customer service. I needed the outfit for an event and I had requested to get my dress in a week and it was actually shipped out within 3 days. AWESOME!!! Thankyou Sarosh, I will be coming back again for sure!!!" "I loved it and am completely satisfied. The stitching , style, fabric- everything was perfect! I would buy from them again. " "outfit is even prettier in person than in pic, Customer service is so **** good that they respond to my queries even on EID days." "I really love it it’s fine it’s comfortable and beautiful "
"Great experience with my first order. Great stitching based on our size specifications and on time delivery. Keep your good standards." "Really beautiful and great quality!!! Was my first time and I’m super picky, but was so impressed. The pants could be a little better quality, they are a little itchy... but other than that, it’s a good outfit! " "Service was excellent every step of the way! I know color representation on a screen can be off but the Farshi pants in this are more of a true royal purple than the maroon shown on the website, which I like better but it was a surprise. I LOVE the fabric and generous size of the matching hijab and that sleeve lining is complimentary, something I’ve always had trouble finding in the past. Will order again for special occasions :)"
"Excellent and gorgeous outfits "
"Did not fit but worked out well for my daughter. The service and quality of stitching is excellent "
"This dress was just beautiful! The fabric, work, stitching everything was on point! and the customer servive is very good also very nice people to deal with 💕"
"This was the first time I ordered clothes from here. I have to say I’m really impressed. This outfit was just beautiful!! on top of that customer service here is very good also! very nice people. I will definitely be shopping here often now 💕"
"The dress I received was even more beautiful than what it appears in the photo. I was repeatedly asked where I bought the lovely dress, and was excited to share about Sarosh Salman!" "Arrived on time, product looks exactly as pic. Fits well. " "Love my outfit, Perfect quality, perfect stitching & true to size. Deserve 5 Stars." "Apart from beautiful designs, I buy from them because their shipping is free. The website works great, you get constant updates. It's an excellent customer experience. " "Best experience ever, love the dress. Waiting for the Eid to rock with Sarosh Salman dress." "It looks beautiful when I wore it." "I love my outfit....it’s so pretty in person. Amazing Customer service." "I am repeating Customer I love all your designs and the customer service is excellent"
"Iam amazed at just how beautiful the dress is in person, the measurements were perfect exactly the way I wanted, and best of all was the customer service I received from start to finish. I will defenitely come back to buy more dresses, Since the shipping is fast and it’s free too!!! " "I have absolutely loved the outfits so does my mum and sister as well. The whole transaction was handled very professionally by Sarosh Salman also the parcel was received right on time. Ordering online and get what you are actually expecting is wonderful. Would definitely definitely going to be Sarosh Salman repeated client. Cheers"
"Firstly I would like to say that I’m absolutely amazed with the customer service. My dress arrived in 5-6 working days and I knew where my package was every step of the way. The dress is stunning, the same as the picture, and true to size. Best part was the free shipping and affordable price. Can’t wait to wear it on eid! Definitely will be purchasing more outfits soon. Keep up the good work! " "The outfit was just as described- beautiful details and fast delivery. I wore the outfit to a wedding reception and I received many compliments! " "Beautiful dress and awesome customer service with fast shipping. Got my order within 5 business days. :)"
"My First time purchase from your store & good experience. keep it up"
"I ordered clothes last minute for my brothers wedding. I was impressed with the work and the service! The work on the clothes is done really nicely and professionally. I think the picture does not justify the amount of work on the clothes. I would highly recommend Salman Sarosh. " 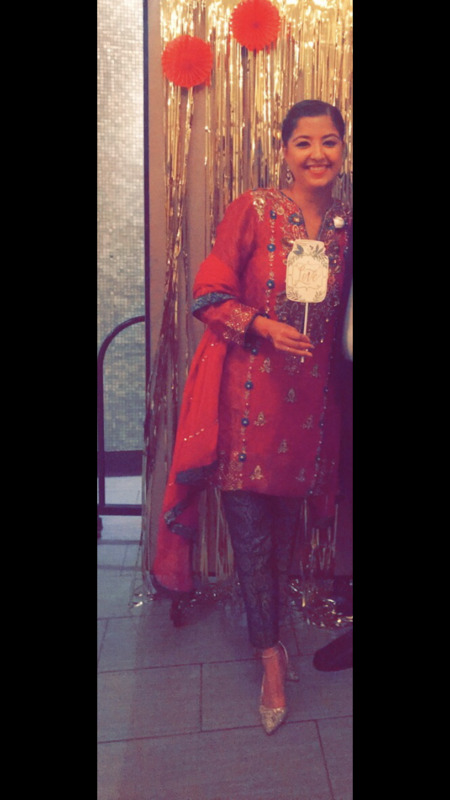 "I've never bought pakistani clothes online so I was very nervous when I decided to purchase my clothes from this site but I couldn't be happier!! INCREDIBLY professional company! I received my outfits in a week and they look absolutely gorgeous in person--wonderful quality. I will definitely be making this my regular shop for my social events :) "